Al Aqsa Mosque was packed today. Thousands of worshippers prayed in Jerusalem's Old City, entering smoothly on the third so-called day of rage. There were few additional security restrictions, no metal detectors, no metal barriers on the way in, and no age restrictions imposed by the Israeli authorities. Two days after President Donald Trump announced the United States will recognize Jerusalem as the capital of Israel, the Palestinian anger was palpable. But the turnout was smaller than expected. 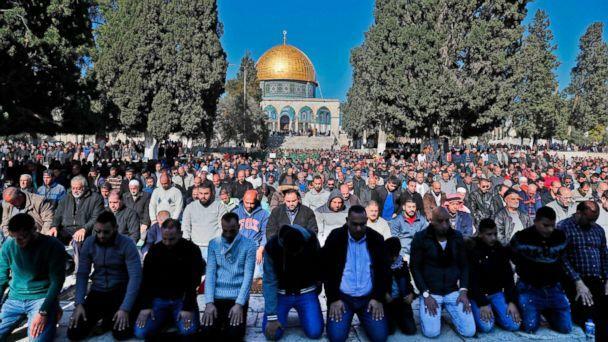 The protests started on al Haram al Sharif, or the Temple Mount, immediately after Friday prayers, the biggest Muslim prayer day of the week. During the sermon, the imam appealed to Arab leaders to take a serious, unified stand against Trump. "We are little here in Jerusalem," Nimar, a Jerusalem resident praying at al Aqsa, told ABC News, giving only her first name. "But our people, our army, our nation is strong. "Trump's decision was very dangerous," she added. Another Palestinian from Jerusalem, Haidar, said, "it's completely unfair." "It's not Trumpland. It's not Trump's decision or anyone else's decision. Jerusalem will always be for Muslims," he added, giving only his first name. After the prayers, a crowd from al Aqsa began marching peacefully up through the Muslim quarter of the Old City. Within seconds, scuffles broke out. As Israeli troops set up metal barriers and dispersed and pushed protesters amid the narrow walls of the Old City, our ABC News cameraman got caught up in the chaos. Our team rushed into a Palestinian souvenir shop to get out of the melee, but the trouble continued there. Flare-ups continued around the Old City, throughout the day, and in the West Bank. In Ramallah, in the Occupied West Bank, fiery clashes broke out, and in Gaza at least one person was shot and killed by Israeli forces in the southern part of the strip. The Israeli military said at least 4,500 Palestinian "rioters" at the Gaza border rolled burning tires and threw rocks and that soldiers "fired selectively towards dozens of main instigators and hits were confirmed."